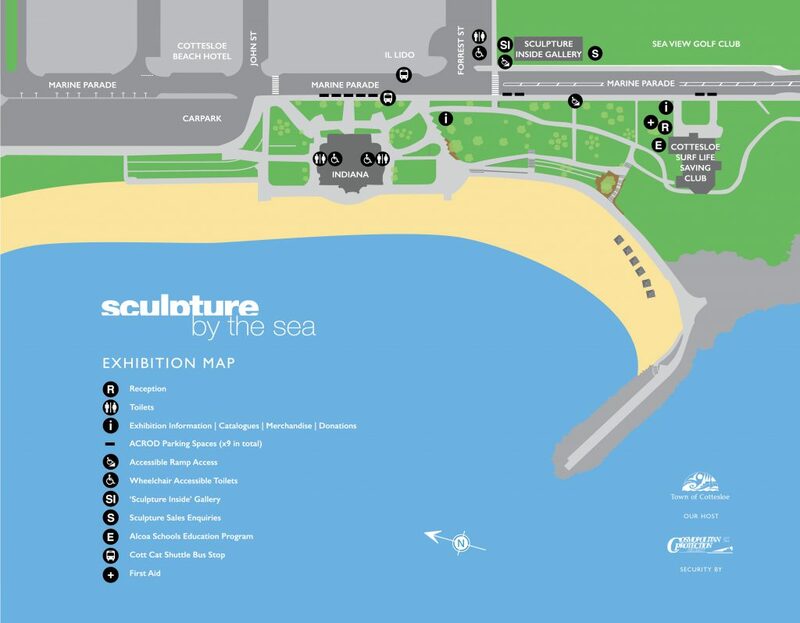 Sculpture by the Sea, Cottesloe is a hugely popular event with an estimated annual attendance of 240,000 people – the majority of which will visit the exhibition during the weekends. When planning your visit to Sculpture by the Sea, Cottesloe please note that this generally means the site is significantly busier and more crowded on Saturdays and Sundays than it is during the week. Accessible parking spaces are allocated on the ocean side of Marine Parade. For information about the Town of Cottesloe Accessible Parking visit this link. Sculpture by the Sea has a designated access drop-off and pick-up entrance point to the site for visitors with limited mobility and/or using a wheelchair. This is located on the ocean side of Marine Parade between Indiana Tea Rooms and Cottesloe Surf Life Saving Club. Vehicle owners will then have to seek parking elsewhere, where normal parking restrictions will continue to apply. There are four existing ACROD parking spaces on Marine Parade opposite Sea View Golf Club as indicated on the map above. And five additional ACROD parking spaces during exhibition only outside Indiana’s.